Rev. 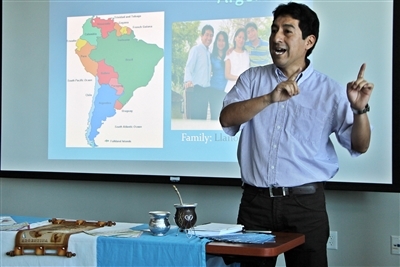 Rocio Barcenas, part of a husband-and-wife missionary team in Argentina, talks about the cultural significance of drinking maté, or tea, from the same goblet in the region where she works. Photos by Tim Turner. LAKELAND -- Three years ago, Rev. William Llanos and his wife, Rev. Rocio Barcenas, were called into transcultural missions work from their home in Colombia to help the people of Entre Ríos, Argentina. Since then, they have worked with churches to develop leadership in a part of the world where making a living and nurturing young people present major challenges. Through an interpreter, Llanos and Barcenas, who speak Spanish, shared their ministry in the Entre Ríos province with listeners gathered last week at the Florida United Methodist Center. Together, the pastors serve four churches in four different cities. Additionally, Llanos has been appointed superintendent of seven churches throughout the province. Some of the congregations don’t have a church building, and worshipers meet in the street or under a tree for prayer and service. “The farthest church is an hour and a half drive from Colón,” where the missionaries live, Llanos said. The couple’s ministry is spread thin because Argentina has a continuing need for more pastors. “Most pastors in Argentina must take on secular jobs to make an income,” Barcenas said. The result of this financial struggle leads those called to ministry to seek a living outside the church, leaving many Argentinian churches without leadership. The need for church leaders remains, as the people of Entre Ríos struggle to make ends meet in a high-risk environment. Rev. William Llanos talks about his mission work in Argentina, where he and his wife pastor several churches and organize outreach ministries. Argentina is shaded in blue on the map behind him, and their mission base of Colón is in the northeast section of the country. At their church in Concordia, the couple reaches out to high-risk kids and teens by leading groups in camping trips and baptismal services. They also organize outreaches to Concordia’s low-income communities in the heart of the drug circuit. In Concepción, where graduation rates are low, the focus is on students. “We help guide them to opportunity under the light of the gospel,” Barcenas said. In Colón, the suicide rates are high among the 16- to 50-year-old population. Outreach from the church in Colón focuses on helping children develop into healthy adults as a preventative measure. Reaching people within the community requires a level of cultural bonding. 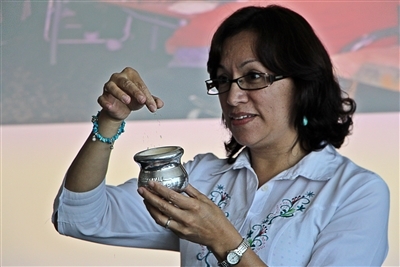 Barcenas demonstrated her experience with a traditional tea called maté. The drink is served from a community goblet or gourd, and each individual takes sips from the same metal straw. Because of the way it is shared, the drink provides an opportunity for communion and socializing. For more information about Llanos and Barcenas, the missionaries and their work, visit www.umcmission.org/Explore-Our-Work/Missionaries-in-Service. -- Tim Turner is digital media coordinator for the Florida Conference.